Today, women are encouraged – at least on the surface – to treat fashion as a form of visual empowerment. In reality, society simultaneously confines and punishes women for their outward appearances. My interest in the cultural impact of fashion is longstanding. As an artist, I have always been intrigued by the idea of fashion as a visual art. In addition, I am passionate about women’s rights and female history, and I think that the connection between clothing and feminism is particularly fascinating. Through my research, I hope to illuminate fashion not only as a crucial part of female identity, but as an instrument for societal change. Here are some questions that I considered: How was clothing used to constrain women in colonial America? What is the role of the corset in relation to the women’s rights movement? How was fashion harnessed by first and second wave feminists? Is fashion currently being used as a feminist tool? I am especially interested in learning about the style revolution that took place during the 1920’s and its dramatic cultural repercussions that remain today. Puritan New England, for example, valued “productive,” practical women over their “ornamental” counterparts (Ulrich). Laurel Thatcher Ulrich, a historian at Harvard University, asserts the traditional belief that “a woman must give up the homely duties of kitchen and barnyard to acquire the refinements of the parlor” (Ulrich). Puritans struggled to survive in the American wilderness, and turned to their wives out of economic necessity (Ulrich). In Puritan America, women were no longer passive spectators, but vital members of the household (Ulrich). Thus, women donned austere shift dresses and covered their hair out of modesty (“Colonial Clothing”). In contrast, European women from the era were smothered by corsets and ornate gowns (“Colonial Clothing”). 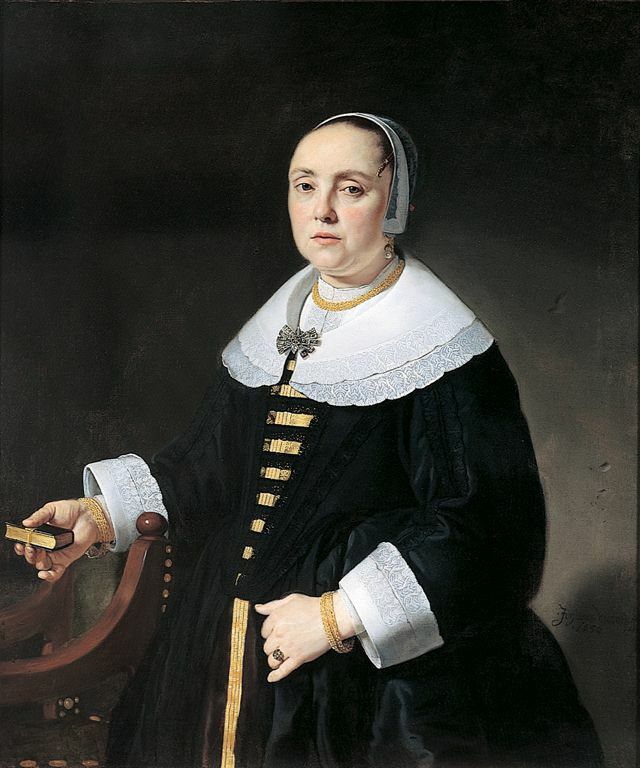 The language of seventeenth century women’s fashion emphasized the fertility and femininity of its wearers, thereby reducing women to decorous objects. In both realms, a woman’s clothing was a reflection her husband’s wealth and power, and defined her limited role in society. The Victorian era (1837-1901) was characterized by widespread social and political upheaval resulting from the Civil War. Opportunities were suddenly available for women to transcend “the cult of true womanhood,” or the domesticized female sphere of the home (History.com Staff). Women mobilized to support charitable organizations and collect canned rations, clothing, and blankets for Union soldiers (History.com Staff). Created in June 1861, the United States Sanitary Commission sought to eliminate disease on the front and employed thousands of female nurses. By the end of the war, America’s middle class had expanded significantly. These affluent women “looked to Europe for leadership in fashions and taste,” which evolved into full-scale “Francomania” (Blum). The resulting mentality stated that “women in their fine clothes offered… an exercise in decorative mastery,” and should dress “as luxuriant[ly] as the decor surrounding them” (Silverman). Subsequently, the corset became a moral expectation; when wearing these garments, the female body resembled –in contemporary eyes– a grotesque hourglass. For Victorians, however, the corset created a perfect physical ideal. While the corset sexualized the female body, it simultaneously affirmed a woman’s moral character. Women who rejected corsets were regarded as indecent and vuglar. In reality, rejecting the corset was to reject physical and social confinement. Fashion at the time was heavily influenced by a new catalyst: the Suffragette movement. Beginning in the late nineteenth century, the suffragettes sought to secure female voting rights by any means necessary. Not only did suffragettes stage intricate public demonstrations, they harassed clothing as both a means of protest and female identity. Suffragists sought to contrast their militant, masculine portrayal in cartoons and newspapers by embracing an undeniably feminine ideal. Their sartorial strategy turned out to be revolutionary, as the accessible fashion compelled women to join the movement. The movement adopted white as its signature color: an allegory for purity and divinity, alongside green to represent hope, and purple for “loyalty and dignity” (Blackman). Discreet suffragists displayed their loyalty by wearing necklaces strung with white, green, and purple precious stones (Blackman). Outspoken women donned ethereal white gowns in order to undermine their critics. It was the flapper generation that would abandon corsets completely and embrace social and sexual independence. 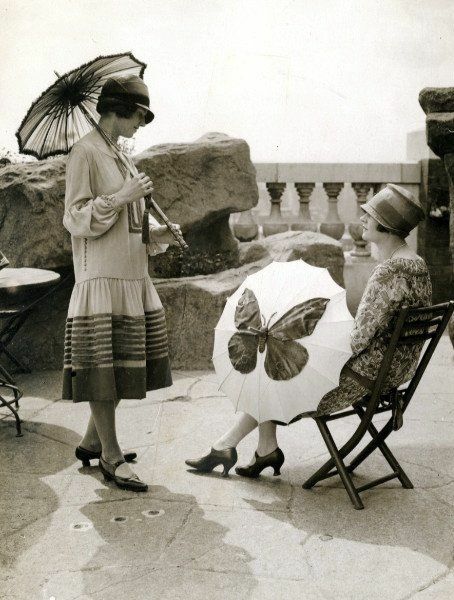 Synonymous with female empowerment, the 1920s have become a symbol of excess, celebration, and revolutionary fashion. Spurred by economic growth and mass production, popular culture adopted a new view on what was considered both socially and sexually acceptable (Joselit). Jenna Weissman Joselit, a cultural historian at Columbian College, writes that the “[victorian] vision of loveliness was coming under attack…by the end of the nineteenth century,” and that “women began to question the relevance of sweetness and preciousness in their [lives]” (Joselit). In addition, an undeniable “tide of scorn for ‘Victorian’ sexual morality… swelled from from popular, intellectual, and social-scientific writers,” which was deemed “repressive” and “hypocritical” (Cott). “Flapper Jane,” the new woman, “…worked for a living, played golf and tennis, and liked to smoke and drink” (Joselit). In 1920, women gained the right to vote, but prevented women from voting as a single party, politically known as a bloc. As female political lives improved, their personal lives improved in kind. More women gained the power to divorce abusive husbands and escape loveless relationships. In addition, it was now socially expectable for women to work independently. 1920’s fashion emphasized boyishness and youthfulness. The newly emancipated flapper embraced an androgynous style with cropped hemlines and cropped hair: “…[flappers] shortened their dresses and cut their hair à la garconne,” short skirts accentuated the wearer’s legs and drop waists created a slender silhouette (Mascetti and Triossi). The fashion celebrated a body unconstrained by corsetry (Steele). Thus, the narrative of Flapper fashion was one of nascent female empowerment. As stated by Joselit, “the shape of a blouse and the length of a skirt… signaled what kind of woman one wanted to be,” whether it was “ornamental, active, or a little bit of both” (Joselit). Young women of the 1960’s adopted the flapper mentality and used fashion to make personal and political statements. Major leaps in the women’s health industry took place during the sixties: in 1960, the FDA approved the first oral contraceptive, as well as the use of interuterine devices (IUDs) eight years later. Suddenly, women held crucial power over their bodies and could further the flapper goal of social and sexual independence. As the sexual-liberation movement began, women’s fashion underwent a transformation. Thus, the miniskirt was born. Pioneered by designers such as Mary Quant, André Courrèges, and Paco Rabanne, the miniskirt took the fashion industry by storm. At mid-thigh length, the miniskirt was the shortest mainstream skirt in fashion history; Second-wave feminists embraced the garment as a symbol of youth culture and sexual rebellion. The average marital age increased, and women adopted the “dolly bird” look: an homage to childhood freedom (Foreman). Nearly one hundred years later – and fifty years after the sexual revolution – women are still defining the relationship between empowerment and objectification in the narrative of fashion. Fashionable women and the industry itself are often dismissed as trivial, superficial, and irrelevant. In reality, fashion has formidable political influence, and a direct connection to the subversive feminist movement beginning in the nineteenth century. In order to overcome this hypocritical ideology, more women need to be in positions of power. Currently, women represent 59% of the US labor force and nearly 51% of the overall population. Shockingly, only 4.6% percent of women in S&P and Fortune 500 companies are CEOs. Increasing the number of women in positions of power is the first step to eliminating gender inequality and creating an equal work environment. Only then will women be defined by their character and skills, and the language of fashion will become another tool for self-expression. At the recent State of the Union address, the cryptic Melania Trump appeared to make a political statement through her choice of dress. 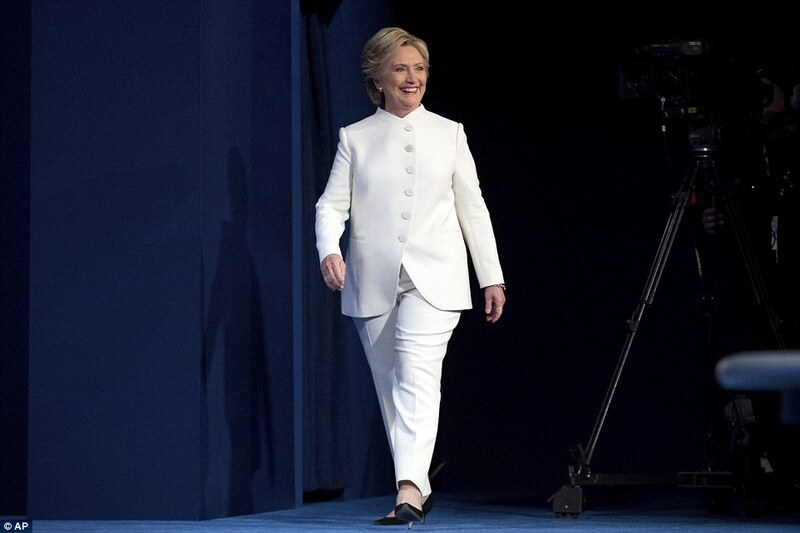 Her outfit was reminiscent of Hillary Clinton’s sartorial signature: a stark, white pantsuit and blouse which stood out against the conservative sea of black skirts and dresses. 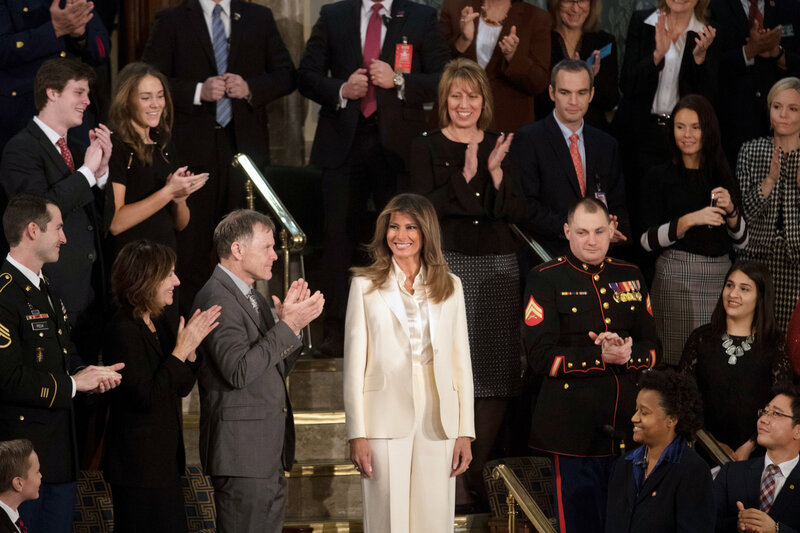 The color white represents “suffragists and contemporary women’s empowerment,” and has become known as an “anti-Trump uniform”; Melania’s pants were an obvious allusion to masculine authority (Friedman). Melania Trump is both a woman in a position of power, and a woman dressed by a professional stylist. As the First Lady, she has endless sartorial freedom, and skillfully conveyed her message: a call for female progress. When women have the freedom to dress the way they like, the narrative of fashion can be harnessed to spur societal progress and experiment with the fluidity of dress. Fittingly, the Pantone color of the year for 2016 was a combination of Rose Quartz and Serenity (light blue). Historically, these colors symbolize the strict boundaries between male and female; merging blue and pink suggests a future where the colors “flow seamlessly” into one another, making it “impossible to tell where one begins and the other ends” (Friedman). There are several personal and political steps one can be take to fight for gender equality. In the personal realm, embracing gender fluid fashion is the first step; wear what you want. Next time you see a piece of clothing that blurs the traditional line between male and female, keep an open mind and contemplate the wearer’s message. In order to create change, political action is vital: support businesses that advocate for equal-pay and inclusivity. Vote for the representatives who do the same. Share your voice on social media, and stand up against sexual harassment. Encourage the men in your life to join you. Together, our generation has the resources and passion to achieve equality between the sexes. Through this fusion of culture, fashion, and gender, women will find equality and ultimately elevate all members of our society. Bailey, Thomas Andrew. The Brief American Pageant. eighth ed., Heath, 1993. Blackman, Cally. “How the Suffragettes Used Fashion to Further the Cause.” The Guardian, Guardian News and Media, 8 Oct. 2015, www.theguardian.com/fashion/2015/oct/08/suffragette-style-movement-embraced-fashion-branding. Blum, Stella, editor. Victorian Fashions and Costumes. Dover, 1974. Carrano , Priscila. “Coco Chanel.” Miss Owl, Miss Owl , 18 Aug. 2014, missowl.com/gabrielle-bonheur-chanel-aka-coco-chanel-2/. “Flappers .” Vintagedancer, Debbie and Oscar , 27 Sept. 2013, vintagedancer.com/1920s/1920s-swimsuits/. Foreman, Katya. “Culture – Short but Sweet: The Miniskirt.” BBC, BBC, 21 Oct. 2014, www.bbc.com/culture/story/20140523-short-but-sweet-the-miniskirt. Fox, Margalit. “Betty Friedan, Who Ignited Cause in ‘Feminine Mystique,’ Dies at 85.” The New York Times, The New York Times, 5 Feb. 2006, www.nytimes.com/2006/02/05/us/betty-friedan-who-ignited-cause-in-feminine-mystique-dies-at-85.html. Martin, Richard. Wordrobe. Metropolitan Museum of Art, 1997. Mascetti, Daniela, and Amanda Triossi. Earrings: from Antiquity to the Present. Thames & Hudson, 1999. Millett, Kate, et al. Sexual Politics. Columbia University Press, 2016..
Silverman, Debora L., and Dennis Collins. L’art Nouveau En France: Politique, Psychologie Et Style Fin De SiÃ¨Cle. Flammarion, 1994. Smith, Jennifer. “Hillary Clinton .” DailyMail.co.uk , DailyMail, 19 Oct. 2016, www.dailymail.co.uk/news/article-3853962/Mourning-end-campaign-Solemn-looking-Melania-Ivanka-arrive-final-debate-dressed-black-stark-contrast-Hillary-s-shining-white-pant-suit-worn-tribute-suffragettes.html?ITO=1490. Steele, Valerie. Fashion and Eroticism: Ideals of Feminine Beauty from the Victorian Era to the Jazz Age. Oxford Univ. Pr., 1985. Thompson, Kirsten. “A Brief History of Birth Control in the U.S.” Our Bodies Ourselves, Our Bodies Ourselves , 14 Dec. 2013, www.ourbodiesourselves.org/health-info/a-brief-history-of-birth-control/. Ulrich, Laurel T. Good Wives: Image and Reality in the Lives of Women in Northern New England ; 1650-1750. Vintage, 1991. Yaeger, Lynn. 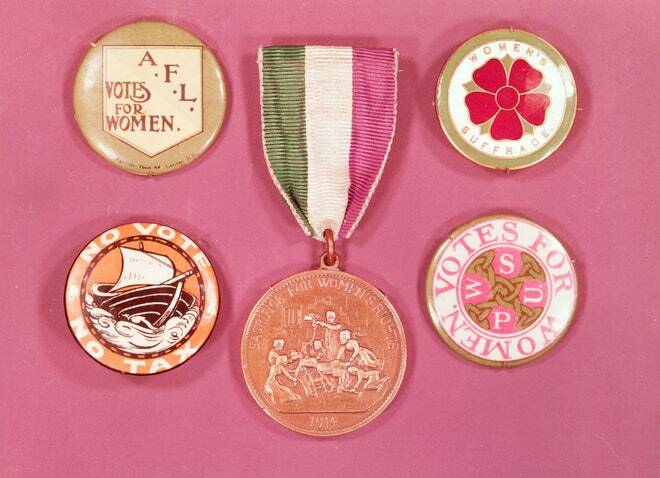 “Suffragette Jewelry .” Vogue, Vogue, 26 Oct. 2015, www.vogue.com/article/suffrage-jewelry-history. “Women in Miniskirts Seventeen Magazine.” Seventeen , Tumblr, justseventeen.tumblr.com. Incredibly detailed and descriptive! I enjoyed your use of photographs in addition to the stories behind them. The use of white to symbolize both purity and power throughout history I find especially interesting in the sense of both a fashion and race. Light and “pure” colors affect the perception of race, as aggression is associated with darker colors. This theme repeats itself even in matrimony (white wedding dresses as a sign of purity and chastity), and in media tone (lighter colors representing positives and happiness, while darkness represents evil and depression). While I love the use of white in fashion, I think that we as a society should move to avoid connecting femininity, purity, and the color white because it in turn creates many other stigmas. Thoughts? Katie- thank you so much for your thoughtful comment! You bring up a very interesting point. I completely agree, I think that it’s time to redefine the color white as a symbol of universal empowerment. I believe that we need to reappropriate the color white and separate it from associations with race, gender, and purity. Is it possible to do so? I don’t know. The symbolism of black and white is entrenched in our culture, just as you mentioned. As another option, the adoption of other colors as symbols of empowerment (such as the Suffragette combination green and purple) might decentralize the stigma associated with white, such as the “lilly-white virgin.” It’s interesting to think about why the Suffragettes adopted white. Cotton was cheap, breathable, and easy to clean; it was used to make “summer-white” gowns, the most popular form of dress at this time. Recently, Oscar attendees wore black to draw attention the #MeToo movement and away from their individual outfits. In this case, black became a symbol of solidarity and empowerment. I hope that our generation can create new definitions for black and white, and that they will remain distinct, yet interchangeable. Hello Chloe! Initially, I was intrigued by your title; it is super clever and defiantly drew me in. I also enjoyed your use of pictures. I felt that you didn’t have excess pictures but rather in perfect places when necessary that added to your writing. Overall I loved the website and found the journey from past to current to be very interesting and fluid. I especially loved your section speaking about Hilary Clinton and Melania Trump’s decisions to wear white pantsuits. Chloe, this is a beautiful topic. You did a great job of linking the history of women’s fashion with the problem today. Your project really shows that fashion is not a trivial thing, but an expression of identity and a force for freedom and equality. I really love this page! I think examining today’s gender inequality through the lens of fashion is incredibly interesting because the progression of the female style is so unique in comparison to men’s. I really enjoyed the history you included and the overall narrative you told. Great job! This was wonderful! I love the timeline structure, as it really takes a reader on a journey. It is really interesting how liked fashion is to social and cultural developments, and despite how obvious it seems in hindsight, I was surprised by your work. It makes me want to read more about fashions and their correlation to social trends.